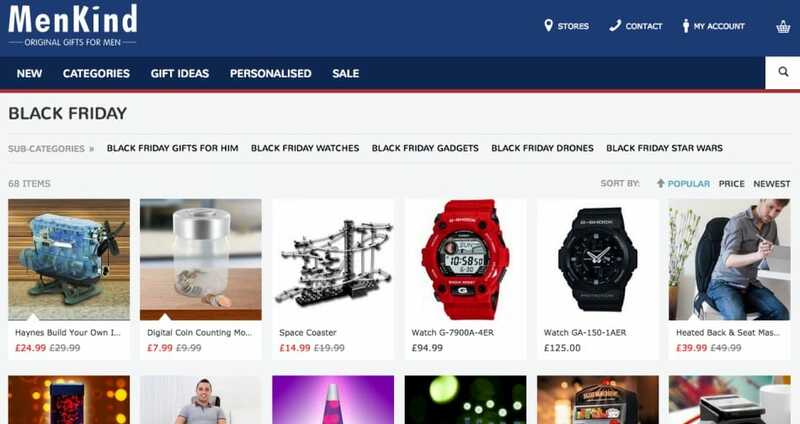 Get ready to buy a gift for him on Black Friday, all the best deals will be listed here as soon as the sale event goes live year year on this page below. In 2015 they were offering up to 50% off on many items such as drones, Star Wars goodies, gadgets, watches and more. Menkind will reveal all on Monday November 20 on its Black Friday offers via this page on the official website. No clue as to when the Black Friday sale will start but they do have 10% off all full priced gifts when using the Menkind discount code XMAS10. There are 16 drones fro sale ranging from £14.99 right up to £1,299, which is the one I would love to have. The dear one is called the Airdog Quadcopter Drone and had £100 knocked off. The Menkind BF deals are up to 70% off, now I am going because I have 571 items to look at. The BF deal of the day is the RC Quadcopter with Camera, which was just under £70 marked down to just under £40. The Menkind Black Friday sale is now live, love the fact they are doing a deal of the day as well. I am waiting to buy the Hubsan X4 FPV Drone with GPS, even though Menkind have knocked £100 off making it now £399 instead of £499 I still would like to get it a little cheaper. Will the Star Wars Force Band priced at just under 70 quid be cheaper during the sale? Would be good to get it at around £50. Yeah last year was really good during the Black Friday 2015 sale. I bought a drone for like a fraction of the price, think i save like £100.